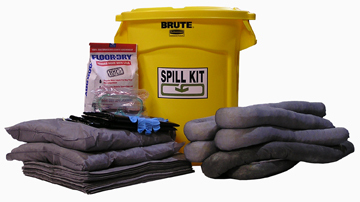 An ideal spill kit for your shop truck or facility. Need a spill kit for your shop truck or facility? This 20 Gallon Brute Spill Kit holds a variety of absorbents to clean up many types of spill, leaks, or drips. Place this kit anywhere a spill is likely to occur. Container is a durable, high visibility yellow Rubbermaid® Brute with a snap on/off lid. Refillable, a refill kit is available. Choose an Oil Only kit to absorb hydrocarbons such as oil, gas, diesel, hydraulic fluid grease, petroleum based solvents and jet fuel. Choose a Universal kit to absorb most liquids such as water, petroleum products, chemicals, cleaners, body fluids, and anti-freeze. Freight quotes are estimates only and do not include fuel surcharges that may change daily. Actual rate may vary.